I mentioned in my burger macaron post that I was going to abandon the French meringue method of making Parisian macarons and try the Italian meringue method instead, but I think I might have been a bit hasty. I really don't want to use an Italian meringue based recipe. I don’t want to deal with making the caramel and digging out my candy thermometer. I also have a tendency to get those sugar threads all over the place when I am pouring the syrup into the egg whites. I know I'm supposed to pour the molten hot syrup onto the side of the bowl and not onto the whisk, but I somehow manage to get it on my Kitchen Aid whisk attachment anyway. So after reading Ms. Humble's many macaron experiments (where she used both French and Italian meringues), I decided to give the French meringue method one more try using Ms. Humble's macaron recipe. The thing about macarons is that there is not one single recipe that will work for everyone. The brand of ingredients, folding method, oven, pan liner (silicone or parchment), thickness of baking sheet, weather/humidity, and the list goes on. I've been trying to find that one recipe that will consistently work for me in my kitchen with the brands of ingredients I use and the equipment I own. I thought that since Ms. Humble lives in Seattle and the weather up there is similar to San Francisco's I might have a better shot at success using her ratio of egg white to almonds to sugar. I've never had problems with getting the foot to form on my macaron shells, but I've never been able to get the correct foot. From my very first attempt at making macarons my foot has been ruffled, but extended too far beyond the border of the shell. But this time my foot was as compact as it's ever been, even though it still sticks out a little bit. 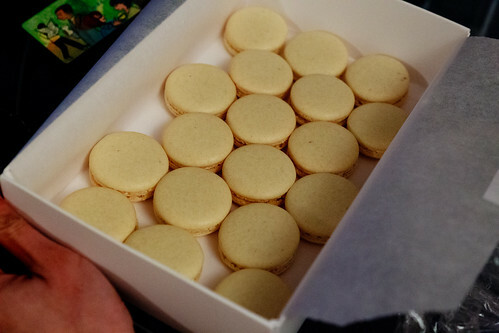 According to Ms. Humble, macarons baked on silicone liners tend to get feet that are ruffled and stick out a little as opposed to the straight up and more compact feet from using parchment paper. 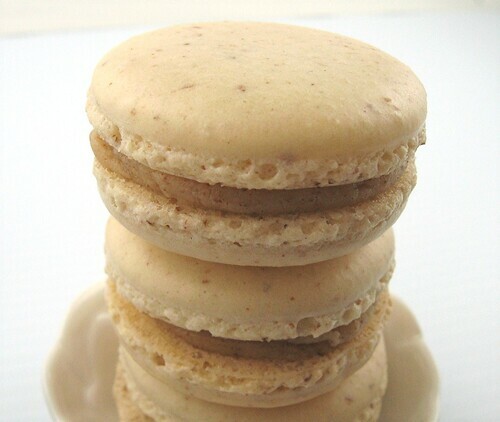 I decided to revisit the salted almond butter filled macarons that I made for the Daring Baker's challenge back in October 2009. I used a combination of blanched and unblanched almond meal. The skins from the unblanched almonds add more almond flavor to the shell. The specks of skin in the shell look quite pretty and I think the rustic quality goes nicely with the salted almond butter filling. 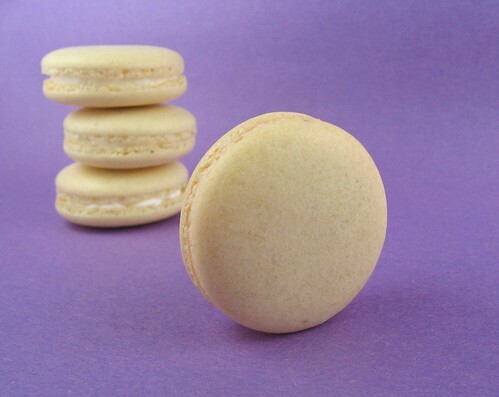 I was quite happy with how the salted almond butter macarons turned out so I decided to try an apricot macaron too. I filled them with an apricot buttercream and a tiny blob of apricot jam. And I didn't stop there. Next up was lemon. The lemon macarons were definitely my favorite. Ms. Humble also mentioned that macarons are best 24 to 48 hours after assembly. So I decided to age my filled macarons. I put them into a container and let them sit for 24 hours before serving. For quality control purposes I did eat a couple freshly sandwiched ones and they were good. But after 24 hours they were better. Not just a little better, but infinitely better. 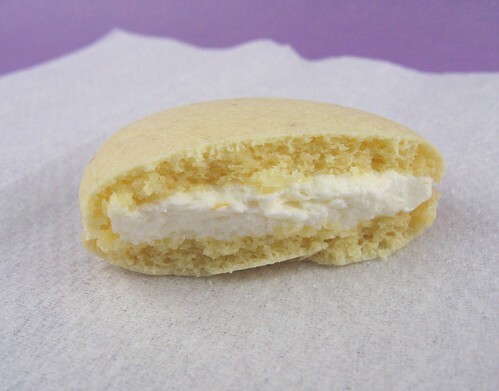 So this is the (French meringue) recipe for macaron shells that is working for me right now. Of course I will occasionally try a different recipe to see if there is one that suits me even more. But until then, this is the one. *Notes: For the salted almond butter filled macaron shells I used half Bob's Red Mill blanched and half Trader Joe's unblanched almond meal. For the apricot macaron shells I used half Bob's Red Mill blanched and half Trader Joe's unblanched almond meal and added some apricot food coloring to the batter. For the lemon macaron shells I used all Bob's Red Mill blanched almond meal and added some yellow food coloring to the batter. Combine the almond meal and powdered sugar in a food processor and pulse until well mixed. The mixture should look fine and powdery. Set aside. Mix granulated sugar and egg white powder into a small bowl. Mix with a fork until uniform and set aside. Beat egg whites and salt on low speed (KitchenAid speed 3) until foamy. Begin slowly sprinkling in the powdered egg white and sugar mixture as you beat. Then increase the speed to medium-high (KitchenAid speed 7). 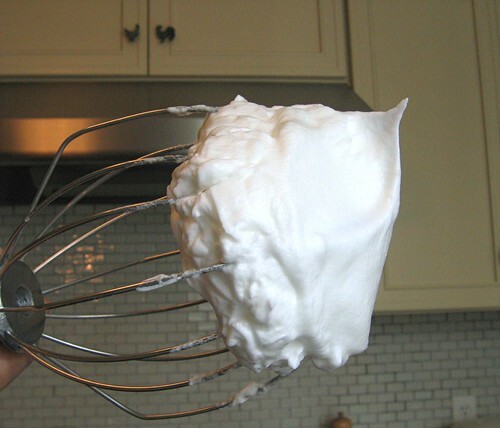 Continue whisking until you obtain a glossy meringue that holds firm peaks. Do not overbeat your meringue or it will become dry and separate into chunks. It took me a total of 8 minutes to get my meringue to the right stage. Add your almond-powdered sugar mixture to your meringue and using a large rubber spatula fold until the ingredients are well incorporated and the batter "flows like magma". You can test the batter by making sure a ribbon of batter drizzled on top of the rest of the batter disappears within 30 seconds. The whole mixing process should take less than 50 strokes. Spoon the batter into a pastry bag fitted with a plain round pastry tip (I like using an Ateco #804 tip). Pipe out 3 cm diameter rounds of batter onto baking sheet pans lined with silicone liners (or parchment paper) spacing them about 1-inch apart. Pick up the sheet pan and tap it on a level surface 4-5 times. This should force out any air bubbles trapped in the piped rounds. Let them rest at room temperature for about 30-60 minutes. In the meantime, preheat your oven to 300F. Then, one sheet at a time, bake for about 15-20 minutes. 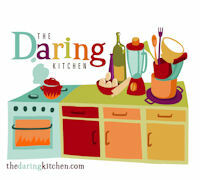 The baking time will vary depending on your oven. Allow shells to cool completely before filling. Put the sugar and egg whites in a mixer bowl or another large heatproof bowl, fit the bowl over a plan of simmering water and whisk constantly, keeping the mixture over the heat, until it feels hot to the touch, about 3 minutes. The sugar should be dissolved, and the mixture will look like shiny marshmallow cream. Remove the bowl from the heat. Working with the whisk attachment or with a hand mixer, beat the meringue on medium speed until it is cool, about 5 minutes. Switch to the paddle attachment if you have one, and add the butter a stick at a time, beating until smooth. Once all the butter is in, beat in the buttercream on medium-high speed until it is thick and very smooth, 6-10 minutes. During this time the buttercream may curdle or separate – just keep beating and it will come together again. On medium speed, gradually beat in the apricot jam, waiting until each addition is absorbed before adding more, and then the vanilla extract. You should have a shiny and velvety buttercream. Mix in the lemon zest. On medium speed, gradually beat in the lemon juice, waiting until each addition is absorbed before adding more, and then the vanilla extract. You should have a shiny, velvety, white buttercream with flecks of lemon zest. Where do you find dehydrated egg white powder? I live outside of SF. dorism- I buy dehydrated egg white powder at Whole Foods (in the baking ingredients aisle). I think King Arthur Flour catalog also sells it. They are beautiful! Well done. I applaud your Macaron tenacity! My Macarons were only a success with the Italian meringue method. (One plus is I now have no fear of making buttercream frosting!) I very much enjoyed reading about your Mac adventure, they're terrific! 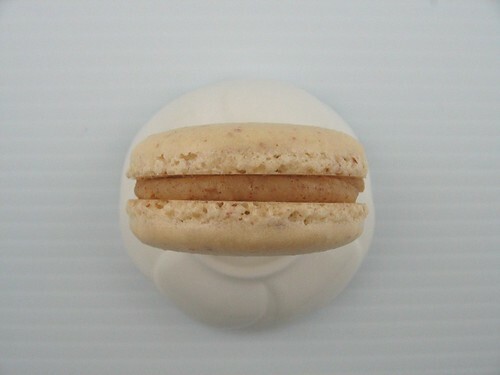 Un delicioso macarons. Me gusta. These look great - can see why they're called "burger macaroons" - though probably even more yummy than burgers! c) watching my oven for "feet"
I thank you very much for telling me about egg white powder. This is the one ingredient which really made a big difference in my macarons. The shells were strong, did not not crack, stored really well in the fridge and were crispy on the outside, chewy and delectable on the inside, especially with the lemon buttercream! I use a hand-held whisk and copper bowl (yes! I was THAT desperate), and this time I turned off the oven fan and baked one tray at a time. I live in Sngapore where humidity is always at an all-time high. 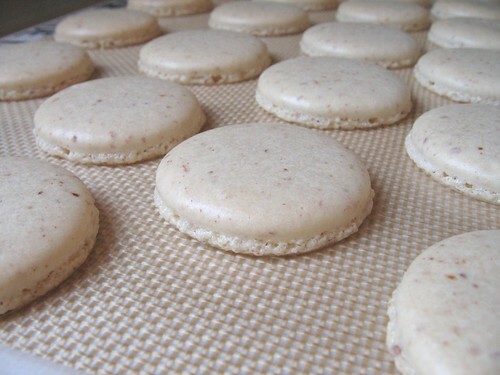 Your recipe is a winner and I will use it every time I make macarons. Thanks for fantastic blog! missing you ... hoping everything is alright and sendig best wishes. Great work! I so wish I dared to try. I have had several attempts but no success. Now I will whip 'email up! Interesting that you decided to use the Italian method, annoying that it didn't quite look out, the picture of the macaroon looks great though! Cafe POA delivers Simple Menu App for Restaurants, Hotels and Food stores.Simple integration with Social Media, existing POS e.g. Aloha as well as Payment Systems to increase sales, improve quality,enhance customer engagement and increase revenue. I like this topic. I want know some helpful things from this side. It is one of the best post from other. It is a useful and charming post.